If you are coming from my friend Sarah’s dining room decor post over at Grace In My Space then welcome! Sarah’s home is so lovely for fall, and she is such a kind soul. I know you enjoyed it. Have you ever walking into someone’s home and it just felt beautiful and inviting? Most likely several of your senses were immediately tapped into, and throughout your stay, maybe after drinking some warm coffee, you walked away with just an overall satisfied and happy feeling. Don’t we want that for our homes too? Well, that is my goal in this article today, to help create an inviting home this fall. Before we move forward, let’s first review what the five senses are: taste, see, smell, touch, and hear. So, let’s talk about how to tap into each one of these senses in your home, to ensure the most inviting fall home for friends and family alike. Creating visual appeal in your home for fall can be done easily. 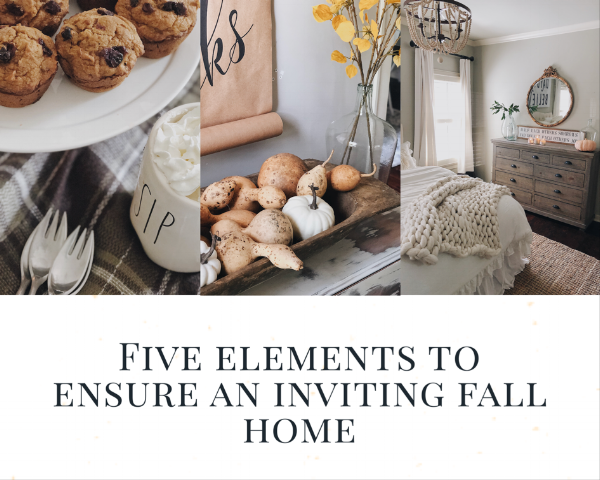 Choose a color palette that suggests fall to you (you can see more of my fall decor here and here), add in florals, fresh and faux pumpkins and fall-themed words in your spaces. Gathering elements from your woods or yard works too! The simplicity yet interest of tree limbs in an oversized glass jug creates a focal point in a room. Tip: for a farmhouse feel, you will want to utilize the time-worn items as your containers like crocks holding fall florals or olive buckets to hold pumpkins. Utilizing candles and baking in the kitchen will add wonderful fall aromas in your home. I love lighting candles in all of our main living areas, along with our bedroom to provide that cozy feel throughout. Whether it’s apple or pumpkin smells, lighting candles is pleasing! These are my favorite fall candles, found here. The other way I enjoy adding fall smells is through baking or having a simmering pot of fall potpourri. My favorite is my mom’s pumpkin muffins which I will share more about below. As I mentioned above, baking items like pumpkin muffins provides not just a fall aroma but a delicious taste that defines that fall taste palette! I’m sharing with you all my mom’s pumpkin recipe below; I hope you will enjoy! Too, having something warm to serve your family and friends can be comforting. Try some of the holiday-inspired coffee creamers (like pumpkin spice) to serve with coffee. Other fall tastes can include warm stews, apple pies, cinnamon roasted sweet potatoes, and hot cider. This is probably my favorite to add to our home, not just during fall but year round. Big, chunky blankets? Check! Lots of soft pillows? Check! Spread these throughout your home, draping them over the arms of sofas and chairs, stacking them in oversized baskets, and opening up a hutch for an easy way to store and use when wanted. Providing your family and friends with these textures to add extra coziness and comfort makes a home feel so inviting. Layers of cozy blankets, pillows, and plush seating invite people to stay awhile. Speaking of staying a while . . . Gather is a familiar term during fall, don't you agree? So, when family and friends gather, it’s a joyous noise to hear! Having spaces that are clutter-free and sit comfortably fosters fellowship. We spend time around our kitchen island and nook area, which has numerous places to sit. Making an effort to clear out spaces and creating inviting spaces will provide much joyful noise in your home. My mom’s pumpkin muffins recipe…YUM! 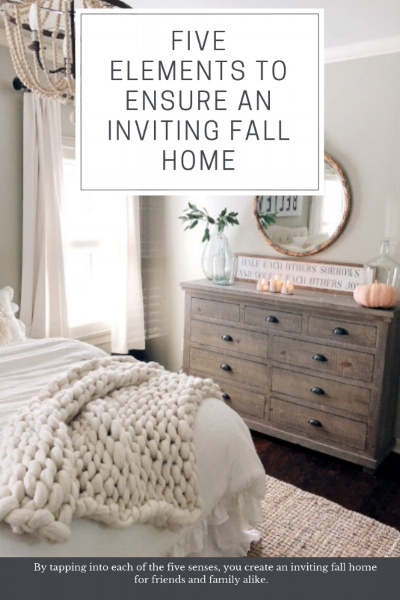 I hope you enjoyed these five tips for creating an inviting fall home. Having each of our five senses tapped into can leave family and friends feeling wonderful as they both enter and leave your home. I am so glad you stopped by, and now encourage you to hop on over to my dear friend Bethany’s home over at Crisp Collective. She is sharing a beautiful fall tablescape, and I know you all will love it!